Here are some of my close music/rock friends that I have met over the years that I am playing guitar. 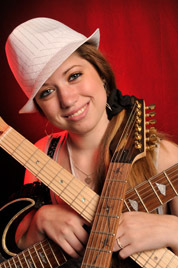 Some of them I know for years others I met over the internet on guitar forms or pages like FaceBook and twitter. In early June 2011 I did a Japanese web cast live streaming teaching experience, where I was playing and teaching for about 8 hours, which was really a cool thing to do, plus I could learn some other new great idea's on licks and techniques and I met a lot of great people living in Japan. Those who live a little bit closer to home are Meul en Ap Hofman, they are close friends for years now. Both share a good taste of music, guitar technique and styles. 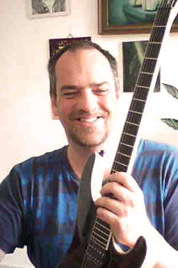 Over the years I have been teaching some of my friends, and because of this I started to record some of my own guitar instructional tutorial dvd's and sold those world wide. This turned out to be a perfect medium; so I could teach my technique and style all over the world. Plus I could teach some friends about "recording your own music". Since I started to do recordings at the age of 8 old, with some analog recorders and effects. So in a way it's good to know that more an more people are returning to good sound of analog recording and effects, and luckily this will never change. I know that I learned it from the best, so I am arrogant enough to say….."I know what I talk about". This is Ap, I met him back in early 1993 by an add in a newspaper, since I was searching for the Boss MT-2 pedal,...and he was selling one. When I got at his house, we started to talk about music, guitars and the styles we are interested in. We plugged in a guitar and I showed him some of the stuff that I learned over the years, he was so impressed by my way of playing those licks that he asked me where I learned those. In that time I watched a lot of REH and Hot Licks videos, and he wanted to trade the MT-2 pedal for the videos I was no longer watching, so that he could learn the same kind of licks and techniques. No we are almost 20 years later and the two of us are still rocking and he became one of my best friends. He has some really cool and unique skills when it comes to the guitar technique, and making music. The intervals he plays sound so much different that what the lick actually is. Ap got later inspired by the guitars that I custom made, so later he did the same...and he build some really amazing stuff. This here is the Meul Monster! (Jan Vermeulen) and I know him since early 1990. 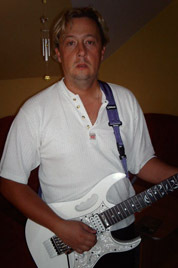 I met him because I was looking for a somebody who could help me with improving my guitar skills in the electric guitar because in those days I only had the acoustic playing skills and background and some little technique on some heavy rock and instrumental music. 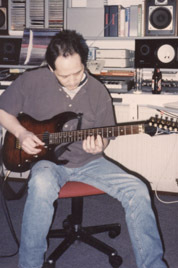 I found his name on a pin board at the Music Maniacs in Haarlem, Rick Duijn who worked in that store was a good friend of Jan and he told me that if I wanted to be a better player in the style of my idols, I had to contact Jan, because Jan was a real shred-head like my heroes of the '80/'90. From day one of my lessons, I was really impressed by Jan's technique and I took the lessons for a number of years. Because he shared the same taste of the early '80 rock, he could open a lot of great new music doors for me, and still he does. Over the years my technique changed in to my own style, but you can still find a little "Meul" inside of me. Still I can be very amazed by the things Meul does in his own music. This is Mr. Doornbosch who I know for almost my whole life, since I started at his music school with the classical guitar playing in my early days. I got to know him by my father who also had music lesson from him when they were younger. 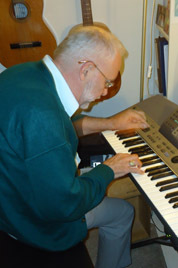 Now days, I having my piano lessons from Mr. Doornbosch and it is always a bless to be there. A very warm hearted family, where love and music is the center of there life. Mr. Doornbosch is on traditionally trained music teacher, and has an mind-blowing knowledge of all the music theory you'll need to know, and he can play any classical music score just by memory, and I guess this is because of his 50 years of experience in making and teaching music. Not only he knows everything about the now days music, but also very classical that was written by Beethoven, Bach, Paganini, and Vivaldi, and all those classical trainings really helped me when I later studied the Yngwie J Malmsteen guitar music, without having a background of the Doornbosch lessons I am sure I never be able to make the music I make now days. 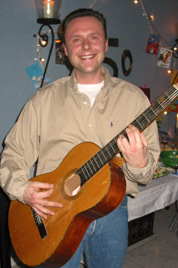 This here is René, I met him at my very VERY early guitar days at the Doornbosch music school. Back in that time I had some acoustic classical lessons. But I could play all the Metallica songs already, and when I met René he asked me what I was mostly playing. And I told hem that my main interest was Metallica, and I played him a few songs. From that day, we met up every weekend and we learned some more Metallica songs. Both of us were listening to Steve Vai his music, and ever time we met we had to play the "For the love of God" song. I did the solo, while he was backing me up by playing the chords of that song. Here is the guy who introduced me to the life of metal and rock music. It was because of him that I started to listen to the heavy metal kind of music back in the early days. From the day that we met, I was really impressed by his look, he was metal all the way. Spikes attached to his jacket, long hair and heavy metal on his walkman. In those days he recorded a cassette tape for me with some of his favorite bands and music. Bands like Iron Maiden, twisted sister, Judas Priest, Overkill, Metallica, Dirty rotten Imbeciles and a lot more give me the impression of real metal music. When I got to know the riffs of Metallica, I knew "I wanna play metal". My metal madness started all because of him. I met Jamie somewhere in the end of 2009 when she was working at the local reptile store here in Haarlem, where I always got the foot for my Red-tale Cost Rican Boa Constrictor Snake. We got to know each other when she found out I was a guitar player and some of here friends spoke about me and the recordings I did. We found out that we shared almost the same musical idols, and since she wanted to learn to play the guitar, I guess it was a year later when I started to teach here some of the basics and techniques she needed to know. I told her that I needed some new photo's for my website, and she told me that she met with a guy who did some of her photo shoots. and he did 80% of the pictures that you can find on this website, and he did all the pictures for the Ramon Koning web site. So later when I needed some more pictures for the website, me and Kriszti went back to Joop for some really mind blowing pictures, So a big "thank you" to both Jamie and Joop for helping me. Please check out the website of Joop Bruurs. 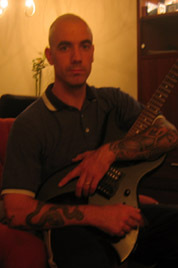 This is Chriss Jetzinger from Austria, also known as Johnboy since he is a big Petrucci fan. As it turned out to be, that we shared the same interest in music and guitars, I did also some helping on the setup decisions for his effects. And from there I helped him with some great artist settings of his favorite guitar players. We did some MSN jam sessions, and he was blown away by my way of playing on my technique. Because of this, I made my first instructional DVD for him, because I wanted to show some more ideas and tricks with a closer look on what I am doing. This helped him a lot with his own style and playing. And two a year later I made him a second instruction DVD. And who knows, maybe I will make he a 3rd DVD. I mean, I am selling those first two all over the world. And I have some great feedback from all over the world, especially from Japan. And this is all thanks to him.